Recent SEC enforcement actions highlight the need for regulated entities and public companies to have policies in place to prevent insider trading, and to follow such policies. In the SECâs July 2011 action against registered broker-dealer Janney Montgomery Scott LLC, for example, the settlement required Janney to pay a civil penalty of $850,000 and to retain an independent compliance consultant to review Janneyâs insider trading policies and procedures and report to the SEC. The Janney order was a warning shot to regulated entities about their obligations to both maintain and enforce adequate policies and procedures to prevent misuse of material nonpublic information. 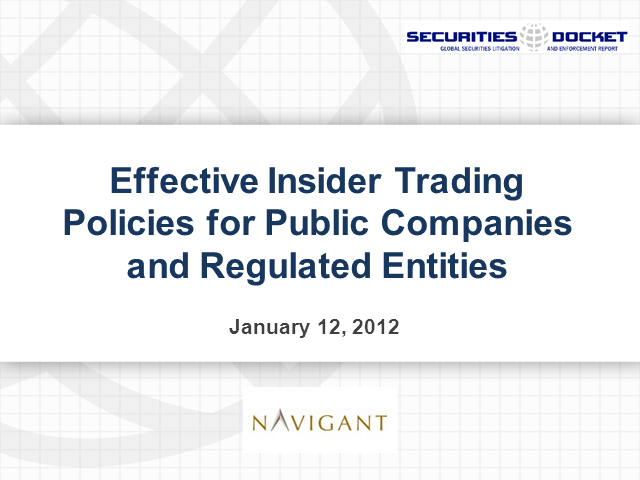 Public companies must also be alert to the need for effective insider trading policies. As a result of the Insider Trading and Securities Fraud Enforcement Act of 1988 (âITSFEAâ), insider trading policies have become a mainstay of corporate compliance programs. A well-designed and properly implemented insider trading policy creates an effective prophylactic against inadvertent insider trading, and provides a mechanism for a company to demonstrate that appropriate steps have been taken to prevent insider trading violations, and to assert a defense against âcontrolling personâ liability for trades made by its insiders under the Exchange Act. In this webcast, experienced practitioners and former SEC and FINRA officials will discuss why strong corporate insider trading policies are necessary and what should be in those policies in order to maximize their effectiveness. Please join panelists Jay Dubow of Pepper Hamilton LLP, and Anthony Creamer and Alma Angotti of Navigant Consulting, as they address these issues and your questions in this free webcast.